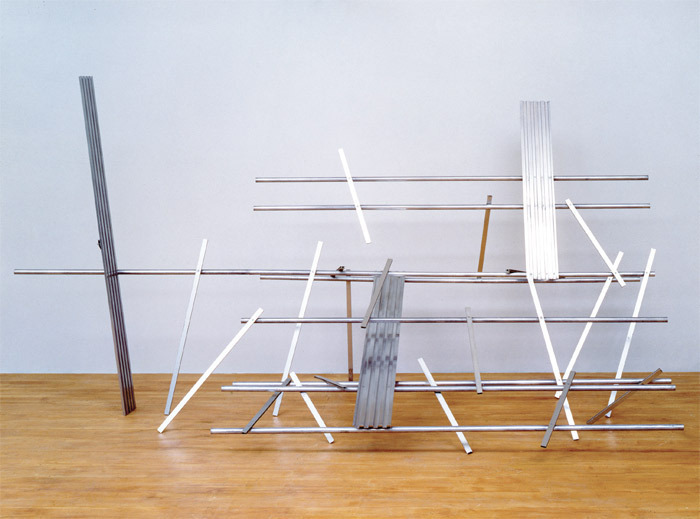 Anthony Caro, Hopscotch, 1962, aluminum, 18' 1“ x 7' x 8' 2 1/2”. Only a few twentieth-century sculptors have been thought to achieve “breakthrough” work. If Anthony Caro can be counted among them, it is due to the fact that in the early 1960s, the British artist’s painted metal constructions managed to “invade space,” to borrow Clement Greenberg’s famous phrase. Marshalling lines of force and direction, yet deploying no preordained pattern, Caro’s pieces seem to be organized according to an axial symmetry that has surrendered to the structural laws of intersection and relationshipan internal energy that in 1963 Michael Fried memorably dubbed “syntax.” Fifty years later, Fried will doubtless revisit that term in his catalogue essay for this fascinatingly far-ranging survey of sculptures, drawings, and three-dimensional paper works from the artist’s nearly seven-decade-long career.